Eiland Elementary School art teacher, Andrea Ramirez, and librarian, Jessica Scheller, have been invited to present at the Literacy Association of Ireland 42nd International Conference to be held at the Marino Institute of Education in Dublin on Friday and Saturday, November 9th and 10th. The conference focus is “Literacy without Borders.” Ms. Ramirez and Ms. Scheller will be expounding on engaging students in experiences that bridge learning and literacy between reading comprehension, fine arts, and library maker spaces. The session, “Building Literacy through Elective Experiences with Art in the Library,” will concentrate on ideas and projects that encourage students to express their understanding of content concepts through creation of visual art. A comprehensive material and book list will supplement the presentation of school-wide literacy-based visual art projects. Ms. Scheller has presented sessions at both state and local conferences about how librarians can be curriculum leaders through integrating literature with core content standards and using primary sources as teaching resources. Ms. Ramirez has taught art at a juvenile detention center where she helped students understand and create original artwork as a form of positive self-expression. Through continual collaboration at Eiland, Ms. Ramirez and Ms. Scheller have developed different ways for students to show understanding and mastery of content standards through visual art. 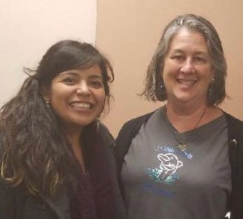 As well as presenting at The International Literacy Conference, Ms. Ramirez and Ms. Scheller will be meeting with a Dublin elementary school to develop a cultural exchange and partnership through the use of Skype, Twitter, and email. Students will exchange art and literacy projects that highlight similarities and rich culture diversity. Think of our students sharing Rodeo art while learning about Irish and Gaelic culture! Congratulations to Ms. Ramirez and Ms. Scheller as they exemplify Klein ISD’s guiding document, Profile of a Leader, by reimagining learning through relationship driven and growth opportunities! All expenses, including costs of substitutes, have been covered through donations and community partnerships.